If someone could pull off a ‘called shot’ in today’s game, I’d love to see it. What do you think? 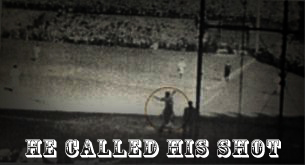 ‘Ruth‘s legendary ‘called shot’ is my favorite legend from baseball folklore. Though, I’m having a hard time thinking of a player that could actually pull it off in recent history? I don’t know? Bautista? He has that intimidating presence? In 1932, the Yankees were met by the Cubs in a competitive and heated World Series matchup. The Cubs had just fired Yankee manager Joe McCarthy two years prior. And the Cub organization was altogether given a bad wrap from the players as being a bunch of cheapskates. Not giving out bonuses and finding technicalities in player contracts, and such. Ruth’s call came in the 5th inning of Game 3 in a 4-4 tie at Wrigley Field. The crowd was raucous, throwing lemons at Ruth throughout the game. A clear waste of fine produce, if you ask me? Really? Who throws lemons? They had it rough back then. After a ball and a strike that ‘legend says’ Ruth took grinning … he made the call. Old footage of the moment shows that Ruth doesn’t emphatically point as much as the story commonly portrays. It’s somewhat of a little wave towards the vicinity of center field. Somewhat shy, and innocent if you look close. A few pitches later Ruth hit a low offspeed pitch to center field that is still considered the longest homerun ever hit in Wrigley Field. Such a moment deserves to be immortalized. I have some good news-bad news in this blog entry. The good news is this week I joined many of the people that blog here by gettting a job. The bad news is finding the time to blog and work at the same time can be challenging, as I’ve experience these last couple of weeks. I’m doing PR right now for an organization that helps local schools educate kids about the environment and possibly raise funds for them to plant a tree at their school. Although I’m not an enormous environmentalist, I do like trees (with the exception of them getting in front of my 5 Iron) and I also like parks (especially ballparks). Regardless of what I like, building a considerate and environmentally conscious youth I believe is a positive step for the future, so at least this is work that I can feel proud about doing. Its better than throwing out every perfectly useable but somehow slightly dented product at Wal-Mart. That is one policy I did not like!!!! I worked their for a brief time during school. Anyway, the outfit I’m working for is called Earth Day. Here is our website for anyone interested: www.earthdayhamilton.ca. The job is only until April, so my graphic design ambitions are not yet gone. With my time off blogging, I created an advertisment for my blog. It combines three of the most important things to me in baseball. The Blue Jays are represented by Carter’s homerun in 93′ along with my favorite player Roy Halladay, baseball history is represented by Gerhig and Ruth (the two players with arguably the most impact on it) and the bobbleheads represent how much fun I have talking about baseball with other baseball fans from all over, while somewhat bobbling my head at times I guess???? The best part is that they are all talkin homer!